Pin-Point Visual Forecasts – The industry’s most accurate current, extended and hourly weather forecasts for your community in an easy to read, at-a-glance format. And only our network updates this information in real-time. Enhanced Interactive Maps – Press and hold anywhere on the map and drop a pin to view current conditions from our exclusive network of weather stations. Enjoy multiple map layers such as Doppler radar, lightning strikes, alert vector polygons, humidity, pressure, wind speed, high/low forecast, traffic, satellite imaging and more! 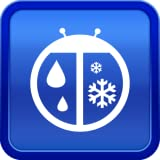 Exclusive DTAs for Severe Weather Alerts – Minutes Matter. Our Dangerous Thunderstorm Alerts (DTAs) provide you 50% faster warnings to severe weather than the competition’s weather alerts, so you know about impending high winds, hail, heavy rain, lightning strikes and tornadoes. Plus, you get National Weather Service (NWS) warnings and watches to stay informed of severe weather conditions at all your current and saved locations. Spark Alerts – Our Spark lightning alerts turn your smartphone into a personal lighting detector. WeatherBug brings minute-by-minute, mile-by-mile Spark lightning strike alerts to you, in real-time, for your exact GPS location. Lifestyle Forecasts – Is today a good day to golf? Should I cancel tomorrow’s picnic? Our new Lifestyle Forecasts identify and analyze specific weather parameters to advise you on how best to stay comfortable and have fun! Live Weather Cams – View live images from more than 2,000 weather cameras across the U.S. to get a better picture (pun intended) of the weather at destinations near and far. My Location – Automatically updates your weather information based on the closest weather station to you in your neighborhood through GPS. Get the latest temperature, precipitation, wind, sun, humidity and pressure information from the largest network of real-time weather sensors in the world. Social Sharing – Knowledge is power, so share current conditions, forecasts, live cam images and severe weather alerts with your social network to empower your friends and family with meaningful weather information so they can make the right decisions.